Minda Danner’s Newly Released “The Shoe Guy” Is the Biography of a Man Who Worked His Way from a Modest Job in a Small Shoe Store to the Corporate Offices of Sears. “The Shoe Guy” from Christian Faith Publishing author Minda Danner is a true story of hard work, perseverance, and adaptability in one man’s ascent from a low-paying job in a local store to a globe-trotting position in the highest echelons of Sears Roebuck’s booming shoe business in the company’s heyday. “The Shoe Guy”, a biography of success, is the creation of published author Minda Danner, a native of Illinois with a lifelong love of writing. Published by Christian Faith Publishing, Minda Danner’s new book is an American success story that began in the impoverished years of the Great Depression and ultimately reached the skyscrapers of Chicago and New York City. View a synopsis of “The Shoe Guy” on YouTube. 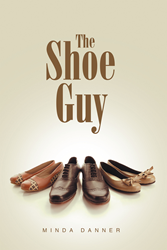 Readers can purchase“The Shoe Guy” at traditional brick and mortar bookstores, or online at Amazon.com, Apple iTunes store, Kobo or Barnes and Noble. For additional information or inquiries about “The Shoe Guy”, contact the Christian Faith Publishing media department at 866-554-0919.